Harvard's new covered hitting and pitching pavilion is still under construction near the Harvard Stadium. 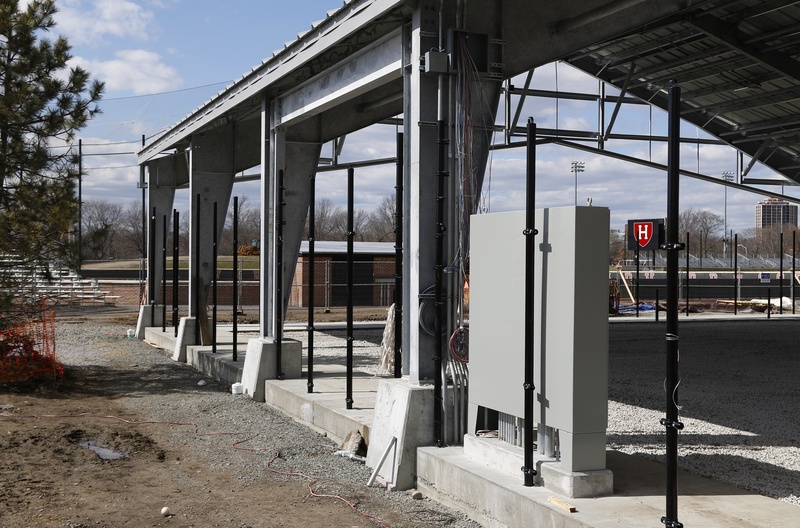 Harvard's new covered baseball and softball hitting pavilion—originally slated to open in mid-March—will now instead open at least a month late near the end of April, a delay at least one student-athlete called disappointing. Three weeks after the facility was supposed to be ready to welcome teams returning from spring break, the pavilion's metal frame and roof stand nearly completed to the left-field side of O’Donnell Field, accompanied by a smattering of construction vehicles and equipment. The fences depicted in initial renderings of the facility and the turf ground cover are yet to be installed. Inclement weather set back the construction of the facility by a few weeks, according to College spokesperson Aaron M. Goldman. Goldman wrote in an email that the facility will open in late April. Some members of Harvard's baseball and softball teams said they were unaware of the revised timeline for the facility’s opening. Hunter B. Bigge ’20, a pitcher for the baseball team, said the delay—coupled with recent storms—has limited the team’s ability to practice. Softball captain Kaitlyn L. Schiffhauer ’19 said her team has also had to practice on the indoor track this spring. She added the softball team has used the indoor track during inclement weather for years. While the indoor track facility gives the teams room to practice, Bigge said the space places limitations on their drills the baseball team would not face in the new facility. —Staff writer Bryan Hu can be reached at bryan.hu@thecrimson.com.